Today was one of those don’t leave the house days. We’re supposed to have bad weather come through in the next couple of days, so I guess we’re hibernating in advance. I literally did not leave the house (except for the front porch to yell at solicitors… but more on that later) until 8 this evening, and that was only to run to Walgreens for face wash. I also did not manage to eat breakfast. Oops. By the time I got Jack up, dressed, fed, played with and then down for a nap, it was already lunchtime. 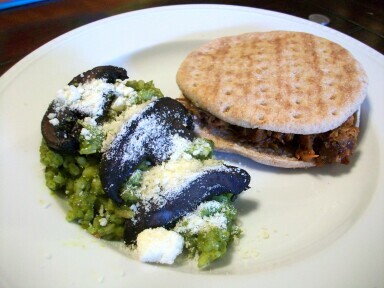 SO I had an early-ish lunch of leftover spinach risotto with balsamic mushrooms, along with yet more pulled pork (have I mentioned that we still have a HUGE chunk of unshredded pork in the fridge, along with a big frozen uncooked hunk in the freezer?) on an Oroweat thin. Around 3:30 I finally got cranky Jack to go down for a nap. All of a sudden someone is literally beating on our front door and simultaneously ringing the doorbell 50 times. Like way too excessive. The dog goes nuts, Jack starts fussing- I was ANNOYED to say the least. I didn’t answer it because the people I actually WANT to see call first. So about 15 minutes later I’m out on the porch taping a “Baby Sleeping! Ring and Die! ” sign to the doorbell when the perpetrator walks across the driveway from my neighbor’s house. “No you CANNOT talk to me now. Your psycho doorbell ringing just woke my baby and now I have to go deal with him.” (Lie- he went right back to sleep. But still…). Lots of apologies ensued and I almost felt a little bad for flipping out on the guy. Brian tells me that it’s perfectly reasonable to knock on someone’s door at 3 in the afternoon. Whatever. I have no idea what this guy was selling but I can guarantee you that I don’t want it. Unless it’s Girl Scout Cookies. But I didn’t see any badges. Tonight I tried a fourth recipe from the Rachael Ray Big Orange Cookbook: That’s Shallota Flavor Spaghetti (groan). It’s a simple recipe to make. The hardest part is peeling and chopping TEN shallots. I was tearing up big time. 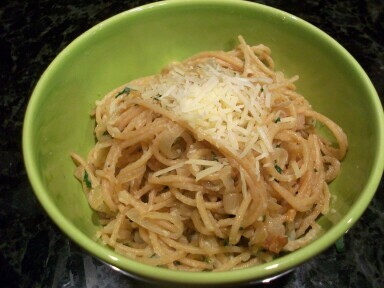 You just caramelize thinly sliced shallots, then mix with whole wheat pasta, parmesan and Italian parsley. Once again, this was not a 30 minute meal. The book said that the shallots would only take 20 minutes to cook, but it took at least 30-40 to get them to really caramelize properly. Also, instead of adding the pasta water to the the shallots, I used 1/2 cup of chicken broth and 1/2 cup of white wine. The result was pretty tasty. It’s a lot richer than I would have anticipated, and if you like caramelized onions (and who doesn’t?) then you’ll LOVE this. Last night it only took an hour to get Jack to sleep in his crib. We’re already at 50 minutes tonight, but we did put him down a little earlier. Ahhh, it’s a slow process. PS- I’m going to add a cookbook section under the “Reviews” tab and link to each of the recipes I’ve tried. Look for that in the next day or two! This entry was posted in February 2010 and tagged Cookbooks, Recipes. Bookmark the permalink. I used to think those with the No Solicitor signs in front of their house were just a bunch of a holes. I’m beginning to change my tune. I completely understand those signs now. The only reason we don’t have one is because of Girl Scout Cookies. I would hate to miss out on those. I would have taken him out right then and there. Yo, solicitor.